In the dream I checked the iPod (my source of date, while my source of time is the camera) and find out that it was the 1st August instead of the 1st of July. I then panicked realizing that all my concept of time was wrong, and 2/3 of my walkabout was already gone. I woke up with the confusing feeling you get when a dream happens too close to waking time, but the iPod was on my side: 1st of July was. The first adjective that comes to my mind is intense. This is how this month was. Adapting to the life on the road in Panama City, visiting the amazing Panama Canal, dancing at the Panama Salsa Congress and then feeling a bit down and up again on the fantastic sailing trip to Cartagena. All in little more than 2 weeks! I stayed 3 more days recovering in Taganga, and as soon as I could walk again I headed to Barranquilla to visit Tatiana´s Ninos en Contacto project. I stayed 3 days in this troubled barrio with locals experiencing ¨the other face¨of Colombia, what tourists don’t generally see (neither want to see). But it would have been unfair to leave Barranquilla without experience its party, proud and happy side so I spent the rest of the weekend there. The perfect place to rest after such a weekend was Mompos where I chill in this great colonial, timeless, genuine town strolling around (or better saying limping around 🙂) along the river side. I deliberately decided not to mix the people I meet along the way with the description of places and experiences. Never the less, people have been the most important element of the trip itself. I met people traveling for years, I met people living in hostels, I met locals, I met a bunch of [email protected]#rs. In Panama I met 2 brothers from Modena, that remembered me how Italians are: little English and no Spanish, looking for the best food at the cheapest price and inevitably complaining about something. At the Salsa congress I met a 40+ Canadian woman living in Panama, but living for good! Self-declared hippie, with great energy and an interesting curious life and still many unanswered questions. Talking with her was so great that we ended up having dinner in an Arabic restaurant on the Causeway. I met Geral, an Argentinian girl talking me in Spanish too fast and too much. On the sailing boat I found Jesus that was giving weed-driven speeches about 2012, oneness, contentedness and Earth chackras. On the same boat I met Silke, a German grandmother that you would not define sportive at all. She was cycling from Alaska down to Tierra del Fuego. A 16.000 Km journey that took her already 1.5 years. On the boat there was also Claes, a Swedish guy on his 4th long trip (the previous one lasted 2 years) that will study to become a policemen, the dream of his life. And in Mompos I met Greg, a French guy that tired of his life decided 4.5 years ago to start traveling. Maybe is a sign from God that he also loves Salsa music and plays congas? You meet and loose people so fast on the road, that you get used to share whatever moment happens with them. And you can be genuine as you have nothing to loose anyway. Hostels in Latin America are full of Israelis in a post-army trip, Americans, Brits and all the rest. Surprisingly enough, I met only 3 Italians in the whole trip! You can find Italians living everywhere, but not traveling anywhere. Music and dance impressed me respectively positively and negatively. Salsa music is everywhere in Panama and in Colombia, and people know artists and songs by heart. I’ve written about the Salsa scene in Panama City and Cartagena and their legendary artists Ruben Blades and Joe Arroyo. There’s even a soap opera on TV at the moment called “El Joe” based on the life of Joe Arroyo… can you believe it? At the same time, Colombia has the best music and the worst dancers I’ve seen. In the Caribbean coast people dance as simple as they can. No turns, no figures, no nothing. Just a kind of side-step movement lasting the whole song. Here in Medellin, instead, they dare to dance Cuban instead. While I stayed in hostels dorms and generally living on little, I haven’t been cheap and/or avoided anything because of money. But well, not all the travelers are IT professionals on a career break*, so don’t take these are general numbers! What a perfect bed time story….. i love it…. when you wrote about the Argentinian girl who talked too much. Good to read it all….. and you talk about money in public? Don’t hang out with those Israelis too much!!! Hehe have fun lot’s of love…..
From my experience Israelis are more fun in Israel. Hi Daniele. Sunday morning in Holland, sipping a cup of coffee and catching up on your trek. As always, it’s good to read. I can easily see myself in your place. Last time I did something similar was with my son in Venezuela in the summer of 2005, traveling from Merida to the Llanos and seeing the most amazing wildlife ever. 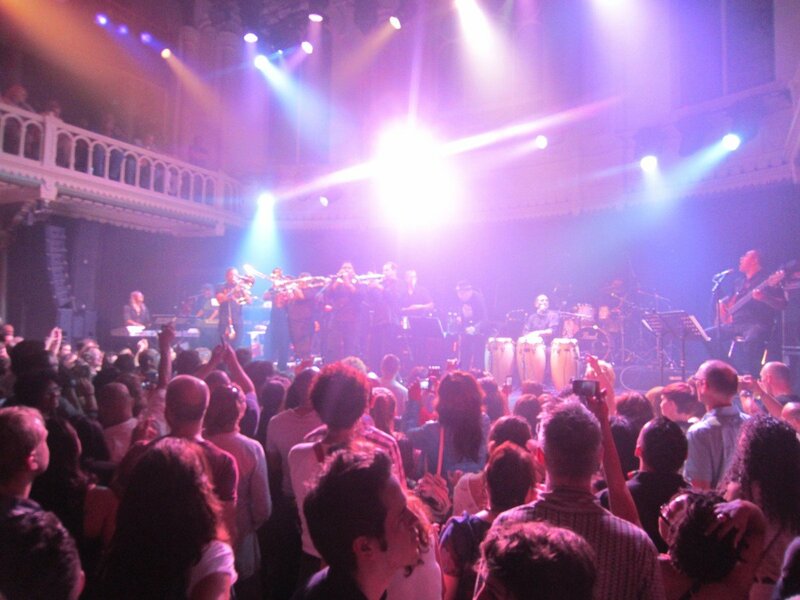 Anyway, just wanted to let you know that if you’re still looking for Ruben Blades, I saw him (perform) in Rotterdam last Friday night. He had a terrible cold but he was still awesome – as was his orchestra from Panama. I hope you’re knee is better (do I ever know how that feels, too) and that you’re careful, particularly with those crazy FARC guys and the ones chasing them. I have so much to write about, I need a vacation I guess! Dance is not about the styling or the amount of turns, but about feeling the music and moving your body from your heart, regardless of how it looks. Through Eric I got your weblog. 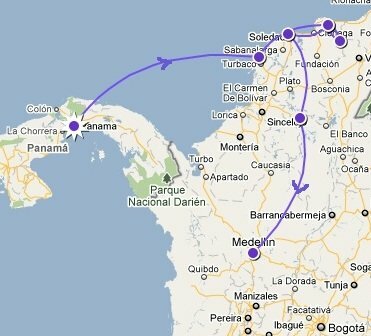 I will be in Cartagena the 18th of August and then spend about one month in Colombia, till I fly back from Rio de Janeiro the 21st. Colombia is magic, every single traveler I met ended up staying here more than expected, because the country and the people are fantastic. I’ve so much to write about… keep in touch!